Passing through the hustle and bustle that exists on Interstate 20 on a cool autumn morning, many drivers are unaware of the calm and relaxed experience that lies nearby in the Talladega National Forest. Talladega is not just a superspeedway in Alabama. The natural beauty of the massive Talladega National Forest will bring people into an awe-inspiring, different world that is found off exit 185 outside Oxford, Alabama. Alabama has four national forests that are part of the the U.S. Department of Agriculture’s Forest Service 191 national forests, national grasslands and land utilization projects. The headquarters, located in Montgomery, are in the early stages of officially linking Alabama’s forest paths to the Appalachian Trail. “Theses are your national forests and they are free for you to use any time,” Talladega Area Ranger Gloria Nielsen said. Into the forest we go, to lose our minds and find our souls as we hope to escape the chaos of everyday life, even if just for a few hours. Talladega is an easy hour and a half drive from Birmingham that takes adventure seekers to the Cheaha Trailhead to start their hike along the Pinhoti Trail. Starting there, people can park their cars for the day at no cost. Hikers then begin along the Cave Creek Trail that will take them to the start of the Pinhoti Trail. The Pinhoti National Trail stretches for 335 miles across Alabama’s Appalachian Mountains and into Georgia. The part of the trail found in Alabama was established in 1970 within the Talladega National Forest. The trail is a loop that leads to one of the best overlooks in Alabama, Mt. McDil (1,730 foot elevation). This is a popular destination for overnight backpacking trips. Hikers all seem to have one simple thing in common: happiness. When people go to Talladega National Forest, they experience solitude. The forest provides a true escape from city life that can be difficult to find in more urban parks. The trail through the forest is clearly marked and easy to follow. During a recent hike, people could be found on the trail traveling for the day from Alabama. 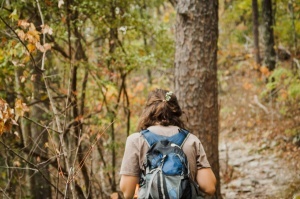 One weekend eight students from The University of Alabama Birmingham went backpacking, and a girls Bible study group from Auburn chose to hike the trail for the day. These people all acknowledge one another along the way on the trail, exchanging well wishes and enjoying the remoteness of the forest. 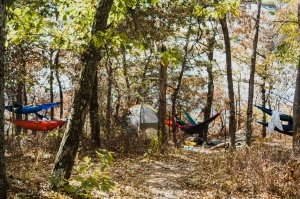 They use this as an opportunity to connect with their thoughts, have conversations with their friends and enjoy the peace the great outdoors brings to everyone who encounters the forest for a day. “The views here are even better than what you see in the Smoky Mountains. I think it’s an easier hike too because it is flatter and it feels much more like the wilderness here,” said hiker Ryan Haskins. Talladega is open year round, but fall can be the most captivating time visually. Shades of red, orange and yellow surround hikers as they step into an enchanting, magnificent world. This is a place where the only noises are wildlife, birds chirping and the gentle breeze swaying its way through the trees. Even the most ordinary, city person who is unaccustomed to being outdoors, can connect with the greatness of the forest. Whether you gather a group of friends or come alone, Talladega can be your gateway to a true escape for the day.